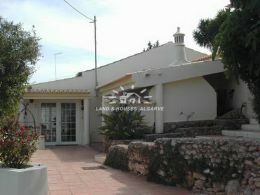 A very beautiful and fully furnished 3 bedroom property located on prestigious golf course near Lagoa. It comprises of an entrance hall with guest toilet, hallway that leads you into the spacious living room with wood burner stove and small dining area with access onto the semi covered terraces and garden. Fully fitted good size kitchen with Formica worktop, creme colored cupboards and gas fired hob. Separate exit to garden area. The villa enjoys 3 good size bedrooms and 2 bathrooms (1 en-suite bathroom) with built-in wardrobes access to either the garden or balcony area. Extra storage area underneath staircase. Central heating throughout the property. Double glazed UPVC windows in stone frames. Connection for SAT TV and telephone connection. Good size well maintained garden with auto irrigation system, many lovely Palm trees and Pine trees. Large 4x8m swimming pool surrounded by terrace and grass area. Cobble stone drive way to garage and off street parking. Mains water and electricity but bottled gas. Direct views of golf course, surrounding greens and country side. 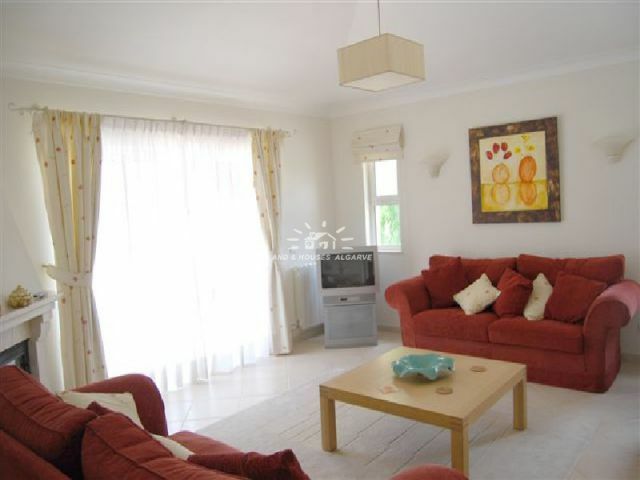 A truly quiet, private and tranquilly area to live and to enjoy the great golfing sceneries.